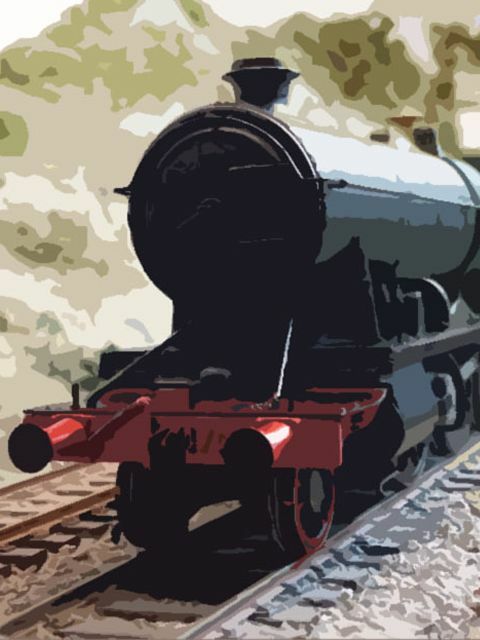 Before we dive into the pro and cons, and the how-tos of Stay-Alive, it is important to state up front that there is no substitute for keeping your track and locos well maintained and clean! 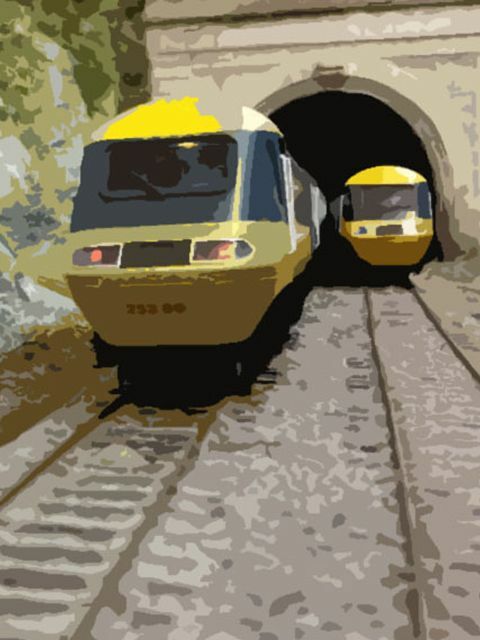 Having said that, even the best locos and the most carefully laid track can still have problem spots, particularly over points, and with short wheelbase models, and these are the situations where stay-alives come in. 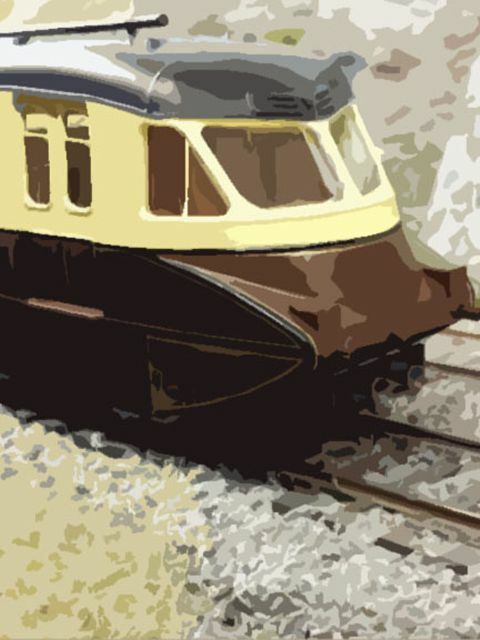 A stay-alive is simply an electrical component (capacitor) which stores energy that can be drawn upon if the loco momentarily loses connection with the track, like a back-up battery. 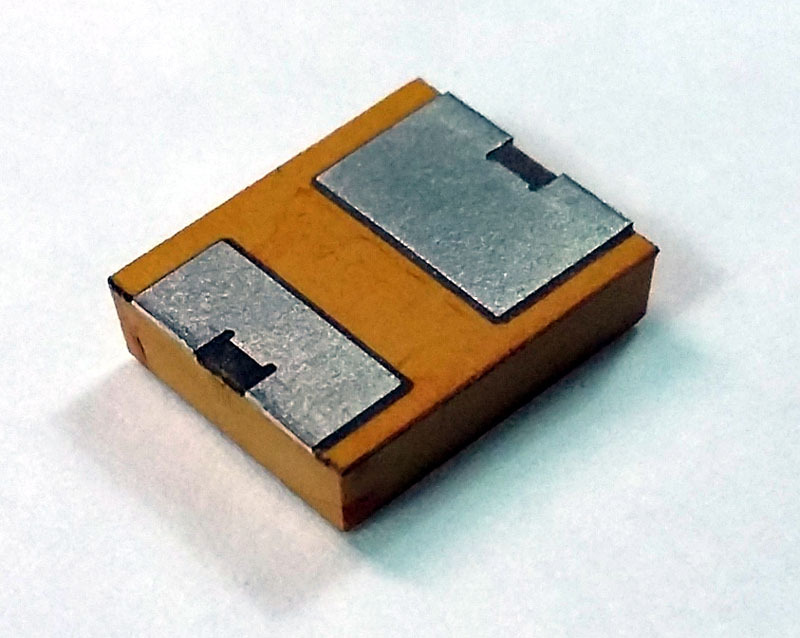 The amount of storage is called its' capacitance and is measured in Farads. The bigger the capacitance, the longer the back-up power will last. Electrolytic Cheap, but large for their storage, usually barrel shaped. The -VE leg is normally marked with a pale stripe down one side and the +VE leg is normally longer than the -VE one. Storage from 220uF up to 3000uF is common. 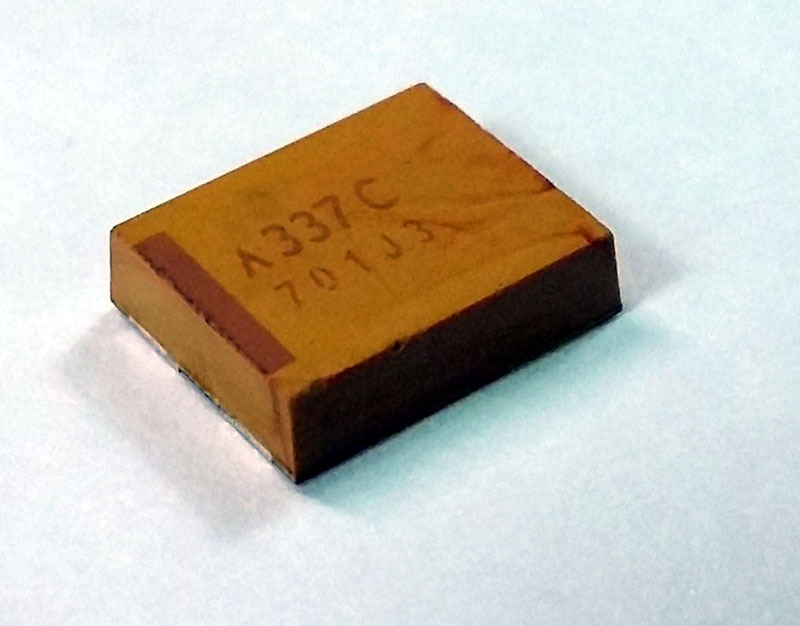 Tantalum Tiny blocks, which offer from 100uF up to 330uF, but can be joined in parallel to create larger storage arrays. 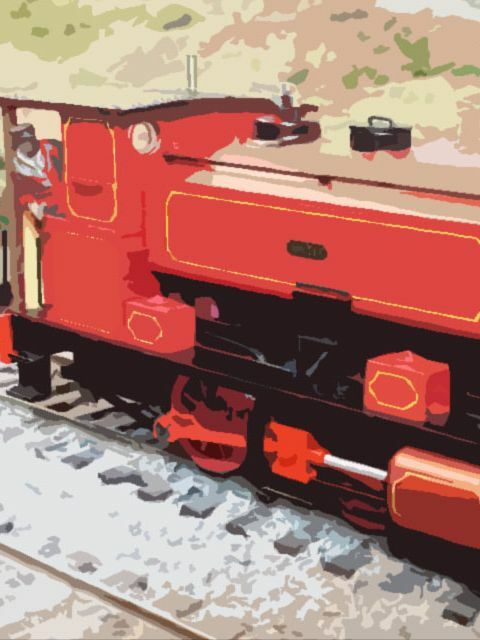 We often use 2 or 3 of these in locos that have little space, and the effect is worth having. The +VE end is marked with a line on the top at that end. 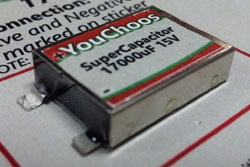 Super Capacitors Much higher storage capacity than other types, but more expensive. Our favourite is the 17000uF SuperCap. The +VE terminal is the end with a single leg. -VE are the pair of legs at the other end, or the case/shell of the SuperCap itself, although different types do vary in their connection, so always read the connection guide for it. Must be fully insulated. The real benefits of a stay-alive are the amount of back-up time that the decoder can be powered from it. 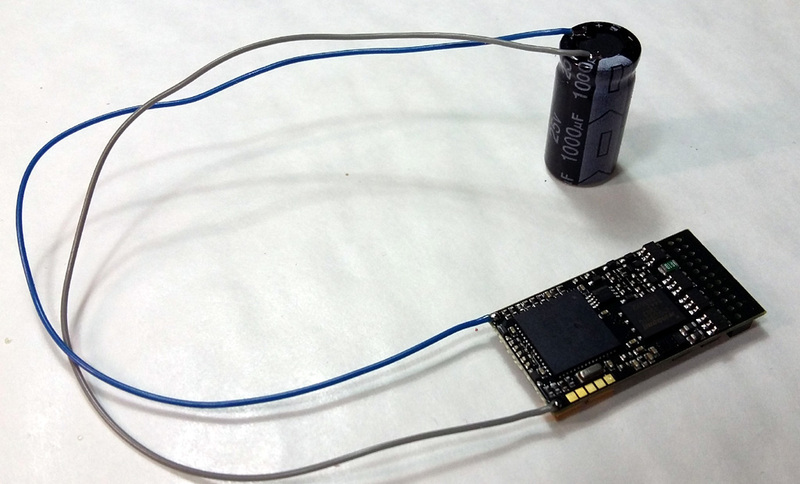 A sound decoder will obviously draw more power than a standard decoder, so power will be drained quicker. 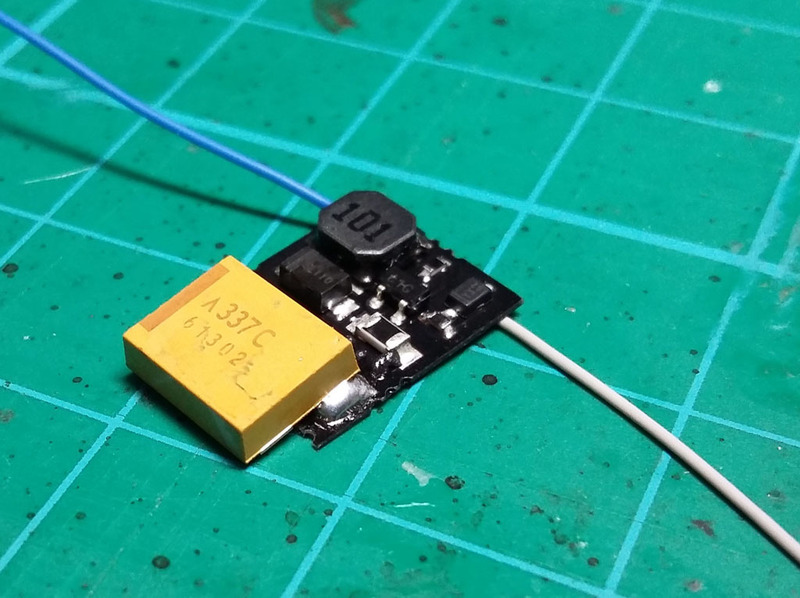 Typcially, a 1000uF capacitor will provide around 0.25 seconds to a sound decoder, and a 6800uF SuperCap will give up to 2 seconds. It may not sound like much, but we are talking about conquering tiny dead spots and dirt on the track, so even 0.1 seconds can be very effective. Almost all decoders can have a stay-alive attached, but the benefits, effects, and side-effects are varied. In theory you just have to identfy a common positive connection on the decoder, and the GND. The capacitors listed above are polarity-sensitive - connect the wrong way around and it will go bang! You should ensure that any capacitor you use has a voltage rating at least as high as your DCC track voltage. 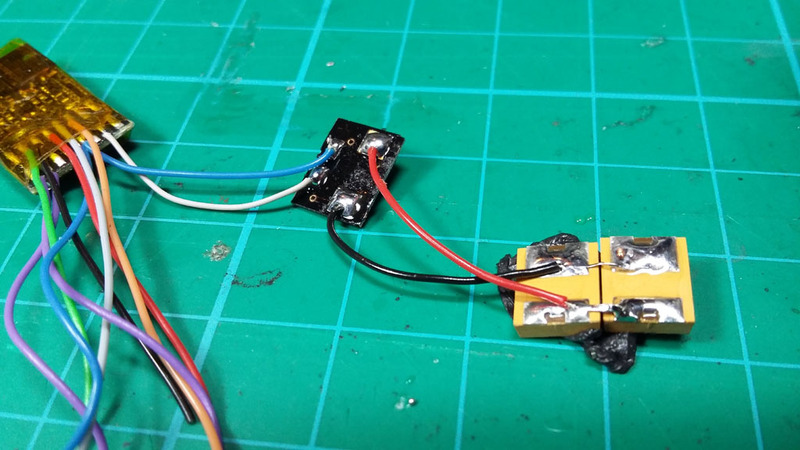 This is noramlly 14 to 15 volts, so a 16V capacitor is sufficient. It is suggested you use 25V where available though. 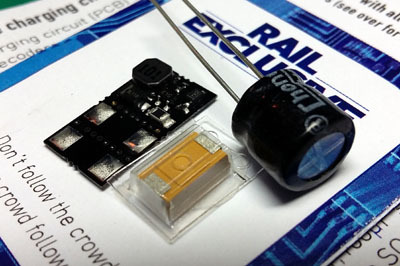 Many SuperCaps only come in 15 or 16V though, so you must ensure you don't run a loco fitted with one of these on a DCC system set to higher than 16V. Same goes for Tantalums - these are normally only 16V. 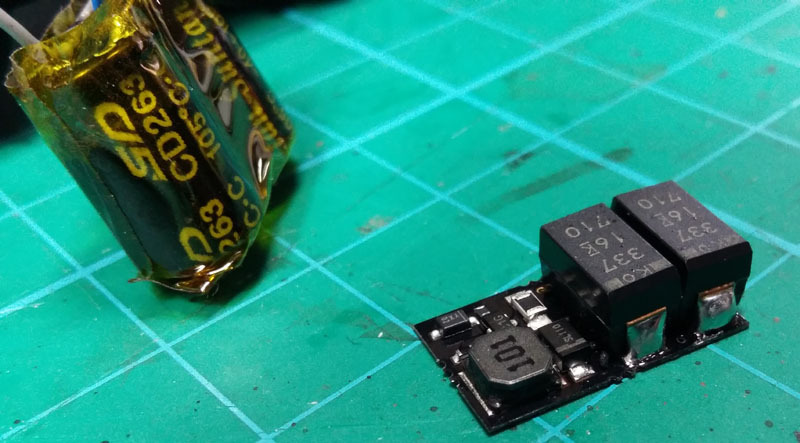 Some Zimo decoders come with additional connections for a capacitor, rated at either 16V or 25V, so check which type your decoder is designed for. As stated earlier, it is theoretically possible to fit a stay-alive to almost any decoder, but there can be side-effects to just a simple connection, such as losing the ability to read CVs back from the decoder. There may also be a risk of surges, so some protection is a good idea. Zimo MX645 and MX644 sound decoders provide dedicated connections for stay-alives, with all the additional management and protection components already on the decoder itself, so connection is very simple. 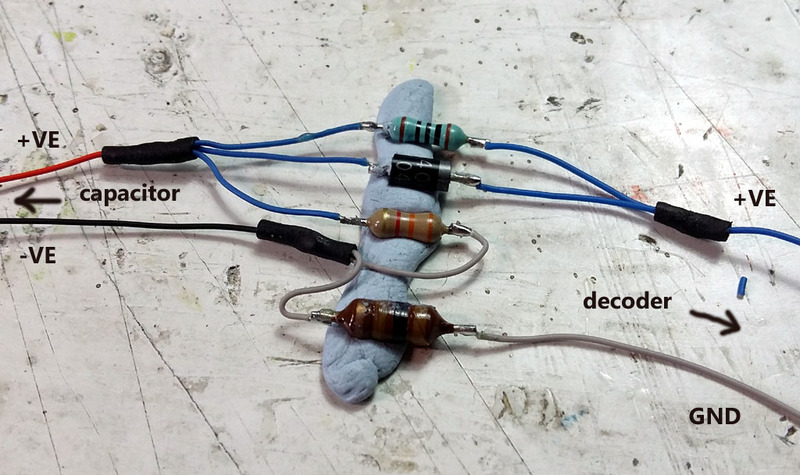 The MX645 comes with an additional BLUE and GREY wire from the 'opposite' end of the decoder (BLUE is for capacitor +VE and GREY is for capacitor -VE). 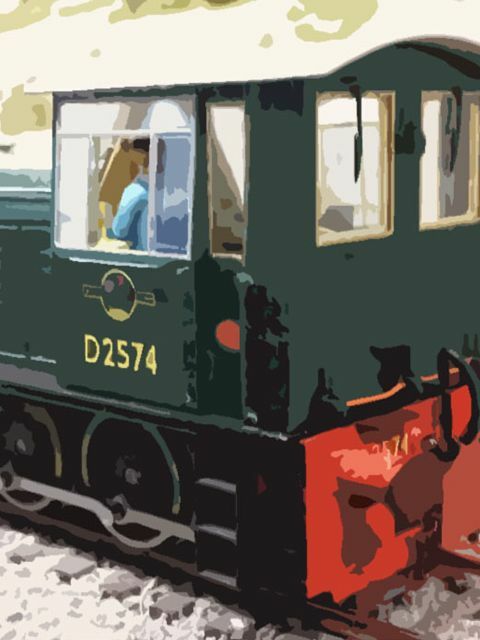 Zimo decoders come with a clever facility known as 'smart stop', which detects when pickup power is lost from the track, and calls on the stay-alive's back-up power to intelligently move the loco on a little bit more until it 'finds' connection again. This just happens automatically without you having to do anything, as long as there is power in the stay-alive available. 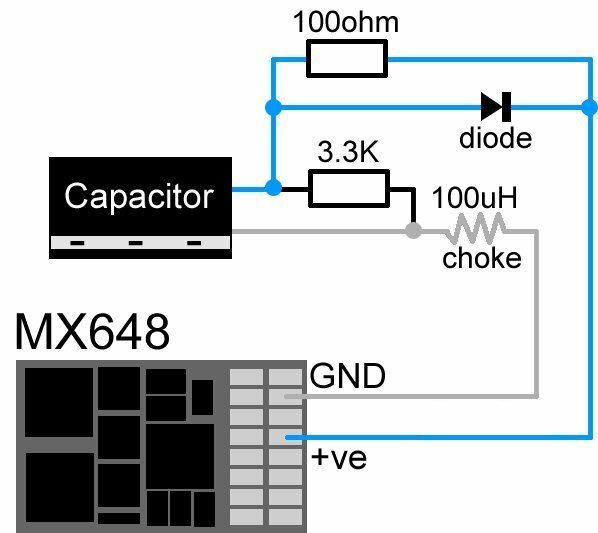 Other Zimo decoders (typically the smaller ones) such as MX648 and MX649 do not have the additional components onboard the decoder itself, so it is suggested that you employ a circuit like the SPIEKOMP kit, or the simpler SACC16 board, joining the capacitor of your choice to that, rather than directly to the decoder's +VE/GND connections. 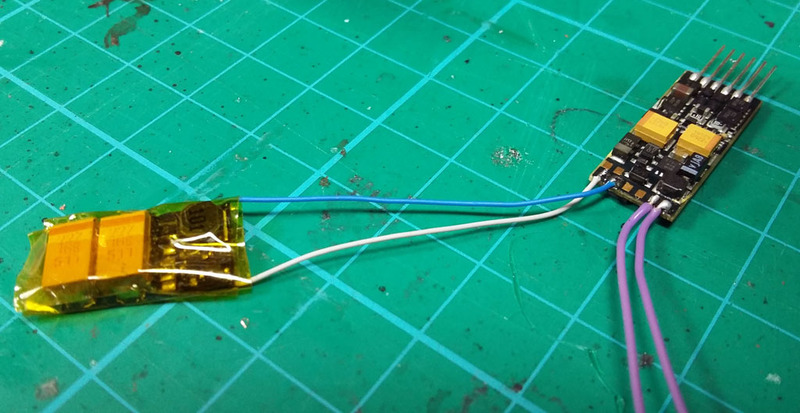 For these decoders it is normal to use the provided BLUE wire (common positive) and solder an additional wire to the GND solder pad (see the Zimo decoder manual for details of where the pads are located). 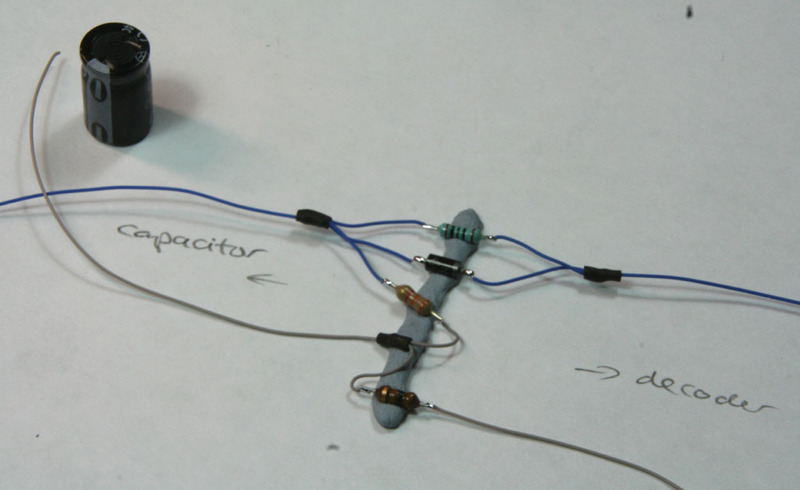 A simple version of the SPEIKOMP circuit is possible where space is particularly tight - again, refer to the Zimo small decoder manual for a detailed explanation. 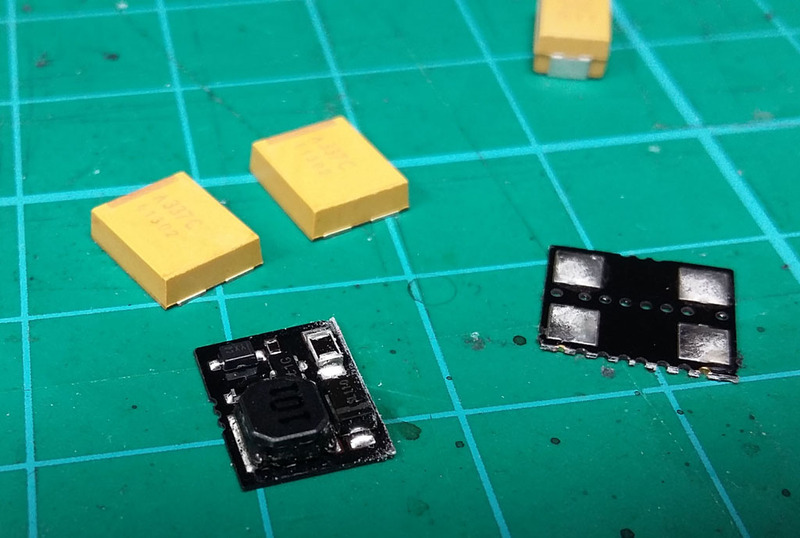 The SACC16 is very well designed in that it provides solder pads for up to 5 small Tantalum capacitors to be mounted on-board, or you can chop off the perforated sections of PCB to reduce the board size and connect capacitors externally instead, such as a SuperCap. 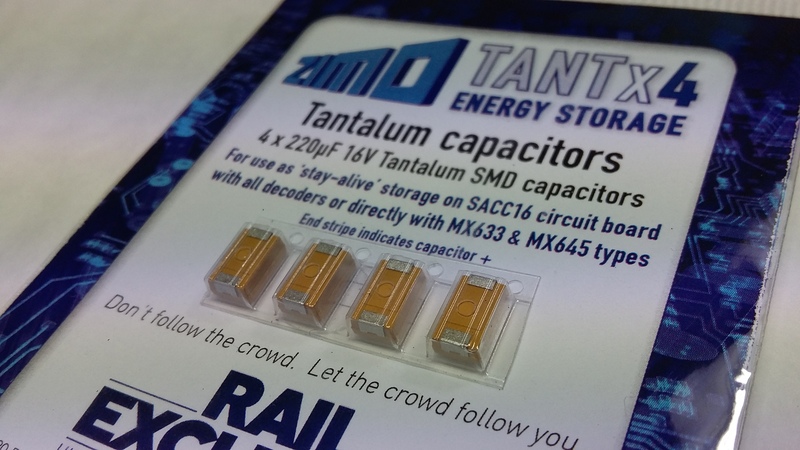 It comes with a single 220uF/16V Tantalum and a 470uF/16V electrolytic capacitor to get you started, and the TANTX4 pack will give you another 4 similar Tantalums to populate the board completely.